I don’t remember the last time I made a meatloaf, or if I ever have. 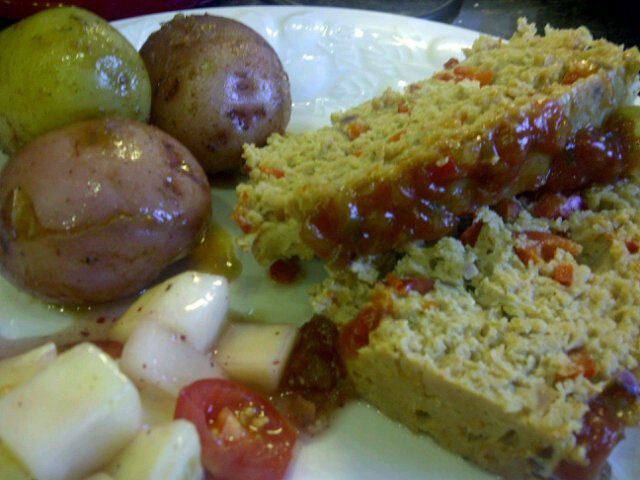 I checked the cooking time for a turkey loaf (35-45 minutes at 350) and just went with stuff I had, trying to get the flavour I had in my head as the right one. I mixed everything through the egg by hand, then incorporated about half of the beef bouillon and the soy sauce. Too much of that and the loaf mix would be too soggy. I didn’t have any bread crumbs, so I used grated Parmesan to soak up the liquid, incorporating it into the loaf until it would hold together. Then into a loaf pan it went. I baked it for about 40 minutes at 350, then I did a weird thing: I spread some relish on top, then some ketchup on top of that, so that a layer of sweet and tangy goodness would form. Back in the over for 5 more minutes, then I took it out. I could have left it in the oven for a few more minutes, to thicken the ketchup-relish layer on top; it still had a little to much liquid in the pan when I pulled it out, which I drained off before slicing into it. And while the meatloaf was baking, I was boiling some potatoes. When the potatoes were done cooking, I drained them and tossed them with some Kosher salt, then melted some butter in the rest of that beef bouillon (did you forget the rest of that bouillon?) and tossed the potatoes in the mixture to cover. And that’s how dinner happened. Adrian and I were big fans; Erin and Emily were less-big fans….the relish on the meatloaf is a weird thing, I think. It did exactly what I expected, hoped, and wanted it to do (provide some sweetness and crunch to the top, mixing with the tangy ketchup and contrasting with the heat from the crushed red pepper flakes in the loaf), but it’s just not something you do to meatloaf, usually. I would do it again, though. Do that on Hell’s Kitchen and you’d be banned from the kitchen. Try turkey meatballs next time. You think they would be dry, but they are not. The secret is to saute your garlic and onions with oil then add that to the meat. It gives it the fat is needs to fry up nice. I love the relish idea!!! I think I could eat your meatloaf for breakfast. I wilt fresh spinach in olive oil and add that. You can get a ton of the stuff in the meatloaf because it shrinks a lot when you wilt it.